The concert scene of the Eastern Shore has been greatly enhanced by the installation of a 65 rank pipe organ that rivals the organs of Mobile and Pensacola. With a 32’ stop as a foundation, the instrument is very complete with principals, flutes, and strings and is crowned with numerous mixtures and reeds, making it versatile for the performance of a large variety of organ concert literature. The 1968 Schlicker-Heissler organ was originally installed and modified in 1997 by Mann and Trupiano Organ Builders of New York City, who also moved the St. James chapel organ. Since then, Darwin Klug of Heissler in America has maintained the instrument, installed a large 16’ Open Wood stop and additional soft stops. Performers on this organ have included such greats as David Higgs, Hector Olivera, Mary Preston, Virgil Fox, Dame Gillian Weir, Sir David Willcocks and Madame Marie Duruflé. The original plans were for a new pipe organ in the main church when the organ committee discovered a marvelous opportunity in a sizable used instrument. In 1996, the Vestry approved the committee’s recommendation to purchase a pipe organ built in 1968 by the Schlicker Organ Company of Buffalo, N.Y. for First Plymouth Congregational Church in Lincoln, Nebraska. Except for the swell division reeds (added in 1990 by Daniel Angerstein) most of the 65 ranks of pipes exist on slider windchests built by Heissler Organ Company of Germany.The Nebraska church used the organ until April 1997 when Larry Trupiano moved and rebuilt the organ with the assistance of Gilbert F. Adams and Darwin Klug who also helped move the Hook and Hastings Organ. This formidable move, involving days of dismantling, an 18 wheeler and a very large U-Haul truck, resulted in a large deposit of organ pipes and parts in the Parish Hall. This unusual display encouraged parish members to raise the additional funds to complete the $200,000 project! Meanwhile the organ console was being rebuilt in Brooklyn. The project was accomplished thanks to total parish support. ​On January 16, 1998, Helen VanAbbema gave the inaugural concert to a capacity audience. Later that spring, renowned organist David Higgs gave a concert. He was preceded by an international performance legacy in Lincoln that included Virgil Fox, Hector Olivera, Madame Duruflé, Gillian Weir, Sir David Willcocks, and John Scott. In Lincoln, the organ pipes were hidden by a cloth screen. Their arrangement at St. James left them exposed in an attractive manner but some case work was necessary to hide the mechanics. This project was completed July of 2003 by craftsman Andy Scott of Bierster Builders in Fairhope, following the inspiration of architect Mac Walcott who is a member of the parish. Darwin Klug of Heissler in America continues to maintain this extremely versatile instrument. The 1896 Hook and Hastings organ was built by a reputable Boston firm for the Visitation Convent in Mobile. As a significant product of the Industrial Age, it is maintaining its integrity well into the Technological Age. In the 1950’s, Visitation decided to sell the organ and St. James purchased it for under $2,000. 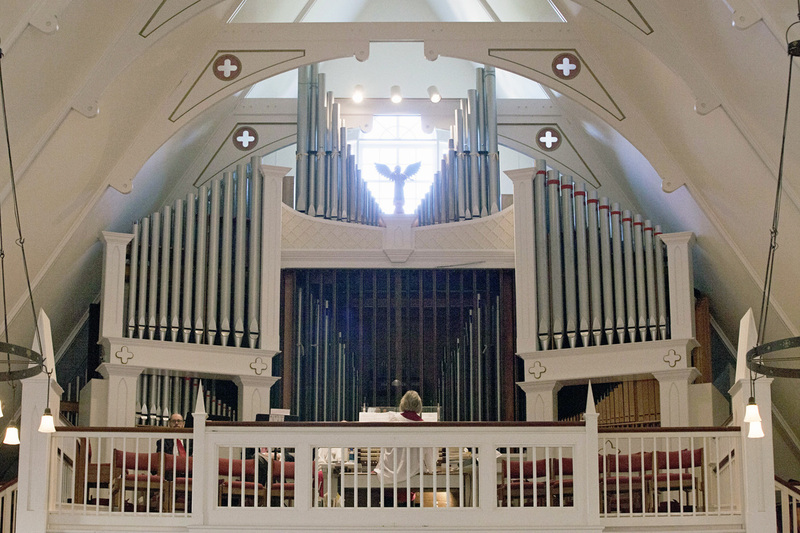 It was moved by the late Ronald Norwood of Fairhope and in it’s new setting, the organ was described as melodious in character but lacking in brilliance. So in the late 70’s and early 80’s, Mr. Norwood added 9 ranks of pipes. This was arranged by electrical additions to the swell manual. The tracker action of the organ was maintained, but electric stop action replaced the mechanical stop action and a new concave pedalboard replaced the original flat pedalboard. When St. James planned the move from downtown to its present location, there was much discussion about what to do with the organ. One idea was to use the Hook and Hastings in the new, larger church which would have involved the removal of the trackers; the very mechanism that gave the organ 98 years of service. The Organ Committee recommended to the Vestry that the organ be placed in the new chapel with the original pipes. This project was financed through the generosity of Mr. and Mrs. Richard Bounds and undertaken in 1994 by Larry Trupiano of Mann and Trupiano, Brooklyn, New York. The Organ continues its purpose of Glorifying God weekly in the 7:30 am Sunday Eucharist, in monthly Evensong services, and for weddings and funerals. Darwin Klug of Heissler in America maintains this instrument.